The North Shore Classics is perhaps not the most serious programme that the Vancouver Symphony Orchestra offers, but when North Vancouverites get an opportunity to see a full size symphony orchestra in their local Centennial Theatre, they show their appreciation by packing the seven hundred and fifty seat auditorium. 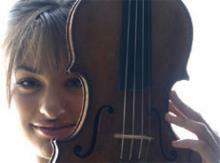 But to see soloist, Nicola Benedetti, winner of last year’s Young Musician of the Year competition and hear a programme consisting of compositions from the great Russian masters could be regarded as a bonus. If the audience came to see if the young Scottish violinist with an Italian name has the talent to match the hype, they could not have been disappointed. Ms Benedetti surely has star potential. Her charisma and musicianship were immediately obvious from the moment she walked onto the stage in a full-length champagne satin dress, and demonstrated her exquisite poise and superb technique. Benedetti’s performance of Alexander Glazunov’s Violin Concerto in A minor was totally captivating and technically outstanding. For such a young performer, she certainly shows remarkable maturity and the verve of an accomplished artist beyond her nineteen years. The concerto’s first two movements, Moderato & Andante sostenuto, are light and fluffy. Her playing in very soft passages was remarkably well placed. The third movement, Allegro is more virtuoso-accommodating whereby the young soloist displayed her youthful ardor and expression. Maestro Tovey’s accompaniment was astounding in its flexibility. Since being introduced to Alexander Borodin’s soaring melodies through George Forrest and Robert Wright’s articulate adaptation in the fifties musical, Kismet, I have held a special fondness for the Russian composer’s only opera. Phenomenal tunes, like "And This Is My Beloved" and "Stranger in Paradise" are clearly and instantly recognized throughout the Polovtsian Dances excerpt from Prince Igor, dramatically played, full of vigour and energy by the Orchestra. This performance of Prince Igor, featuring the gloriously sonorous register of Ellis Wean’s tuba, seemed to be based on the Glazunov version of the score, which was completed after Borodin's death in St. Petersburg in 1887 - The same Glazunov whose works were featured earlier in the evening. The evening concert’s selection also included three works by Peter Ilyich Tchaikovsky. The short but beautiful waltz from Sleeping Beauty followed by the romantic overture from Romeo and Juliet and the monumental 1812 Overture Opus 49 to conclude the evening programme. The only non-Russian work to be featured was a 2010 Olympics Commissioned piece entitled Above the Clouds by Toronto composer Katarina Curcin. This was a World Premiere performance of this piece by the VSO and is the latest in a series of works designed to introduce some of Canada’s brightest young composers to a wider audience. Ms Curcin was presented to concert-goers by Maestro Tovey.